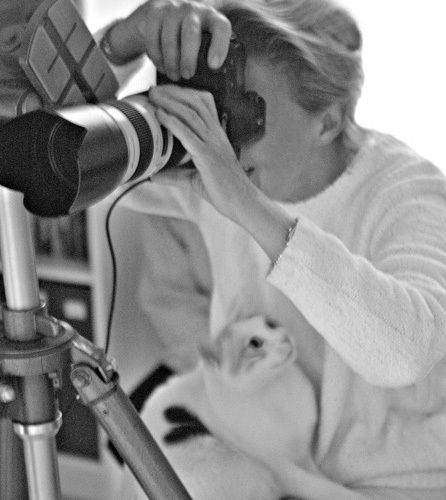 fashion editor for Rizzoli for ten years and from then on independent photographer. Moving to New York, she specialised in fashion photography at the International Center of Photography and then in black and white portraiture with Robert Mapplethorpe. Her rich file of portraits gave birth to her first book “Portrait” and important exhibition at the Museo della Permanente – the Milanese Gallery of Modern Art. Her fortuitous meeting with the conductor Riccrdo Muti at La Scala opened up a new period dedicated to the theatre and the opera with the magical music of Verdi. Thousands of photographs of productions from Milan to Tokyo were ready for a new book “Verdi on Stage” and an exhibition of the same name, which, after opening in Parma at the Palazzo Farnese, was invited by the New York Public Library first to the Lincoln Center and thereafter toured the United States.Returning to Milan, she opened her own photographic studio and continued to work with many different national and international publications. She was present at a lot of journeys as special correspondent. To Washington at the White House, to Moscow at the Kremlin, to Peking where she covered the “Fourth World Conference on Women” for the Presidency of the Council of Ministers for Equal Opportunities. Long journeys in China, India and Armenia gave rise to further books followed by personal exhibitions in Italy and the United States, starting from New York, her second city.